Wait, did Cory and Topanga actually date in real life?! 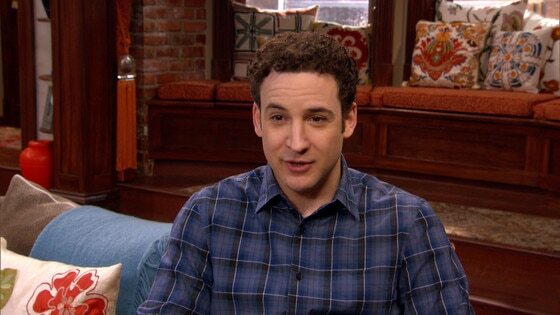 Sure, Ben Savage and Danielle Fishel play one of TV's most iconic couples on Girl Meets World, Disney Channel's buzzed-about series that finally premiered tonight and introduced viewers to Cory and Topanga's tween daughter Riley (Rowan Blanchard), but did the duo actually date during their time as teens on Boy Meets World? That is the question we wanted—no, needed an answer to when we visited the Girl Meets World set to chat with Savage and Fishel about their onscreen reunion: Did they ever have crushes on each other growing up? Growing up, it seemed like every viewer had a crush on Topanga (That hair! )...including Savage! "How could you not? She's the best," he gushed to E! News about his on-screen wife. "She's a beautiful person inside and out. She's kind and smart and everyone loves her." Despite Savage's crush admission, it seems like the co-stars never actually dated, with Fishel telling us, "We've always been best friends and what is there not to love about Ben? He's obviously very handsome, he's very smart, he's very, very funny. Nobody makes me laugh more than Ben does. But Ben and I have always been just best friends and like family members." But little did she know Savage was standing nearby and overheard her answer. His response is priceless, so press play on the video above to see the hilariousness go down! For more Girl Meets World Scoop, including how Cory will "emulate" Mr. Feeny as a teacher (Aw!) and Easter eggs BMW fans should look out for, watch our interviews with Savage and Fishel above. PHOTOS: Here's what your all-time favorite TV couples are up to now!